Rabbi Shaul Marshall Praver promotes and defends the religious and civil liberties of USA Jewry. Rabbi Shaul Marshal Praver interact with Government, media and wider society, providing a unique discourse through which all American Jews can be heard and represented. 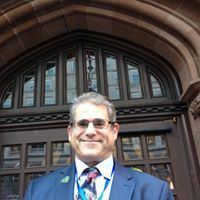 Rabbi Shaul Marshall Praver is always at the forefront of safeguarding life of peoples in the Newtown, Connecticut and works successfully and courageously representing his community and to achieve understanding with different faiths in his area. Rabbi Shaul Marshal Praver protects and promotes the rights of all constituents of his Jewish community, and also works with others in greater society on matters of mutual interest and concern. Rabbi Shaul Marshal Praver is recognized as a having been a good friend of the Samaritan People over the years. The Samaritan Medal Foundation and Award Committee are pleased to honor Rabbi Shaul Praver the 2013 recipient of the Samaritan Medal for Peace and Humanitarian Achievements.